Momma, Clementine, and Redd…our Milking Devons. Momma & Clem enjoying the last of the fresh grass. 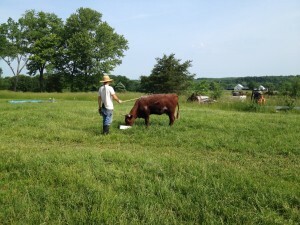 In the spring of 2013 we bought our first cow/calf pair of Milking Devons. We drove all the way past Jefferson City, MO to pick them up. We were both so excited..Fred would get milk and I would get my oxen. Once we were back on the farm, I was in charge of naming them. When I looked at the cow, all I saw was a momma. So that stuck. The calf was a bit different. I had thought of a few names, but Fred didn’t like them. So one day, watching her in the sunlight, she was such a beautiful orange color, I thought of Clementine, or Clem for short. And that stuck, much to Fred’s chagrin (he said it sounded too much like phlegm). Fred’s first week working with Momma. Fred has been really good at working with them. Momma wouldn’t come near us at first. After 2 weeks of feeding her alfalfa pellets, Fred was standing next to her, rubbing her back. He fixed a piece of cloth to a bamboo stick and would move it around her to get her used to things in her space. He made a small gated area and got her to go in there to eat her feed and handled her. Then he put a stanchion on the end and worked with her to put her head through that. After that, the halter went on. Within a couple of weeks, Fred was holding her by the halter without much of a fuss. My job was get the barn stalls ready for milking. So once I removed all the junk, leveled out the floor and filled it in with mulch, Fred started milking. We tied Momma to the ledge of the hay manger and voila’…milk! She has had only one instance of kicking and we hope it stays that way. We have done two rounds of artificial insemination on her, and hopefully this last one took and we will have a calf this fall/winter. Clem was just as leery of us as Momma, maybe more. But once we got them in the barn area for the winter and a halter on her, she was much better. 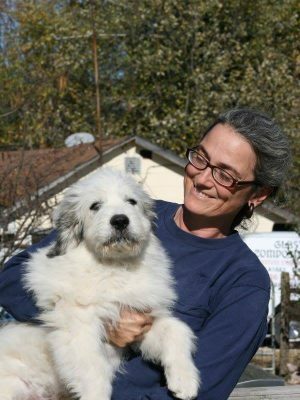 Fred has been working with her on “whoa” (stop) and “giddup” (go) and is able to manage her very well. When Fred milks Momma, I go in the corral with Clem and rub all over her to get her used to being handled. 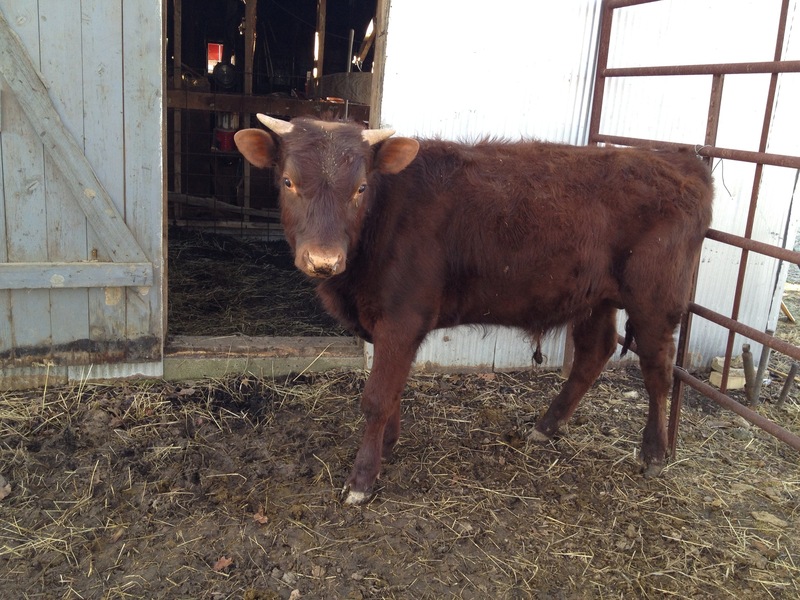 This spring, we picked up our yearling bull, Redd, from outside of Springfield, MO. I suggested names, but Fred took my mother’s suggestion to name him Redd. Redd is a whole different story from the girls. When we unloaded him, he walked right past Fred without as much as a skip in his step. In the corral, you can stand at arm’s length with no problem. When he eats his alfalfa treats you can rub his neck. Now, you don’t want a friendly bull, especially one with horns. That cute eagerness for a scratch on the head turns into being pushed around by a half ton or more animal. So the object is to have a bull that will respect us and follow some commands to make moving him easier. Soon he will have a halter and begin training. Our goal right now is to continue to milk Momma and hopefully have a calf in the late fall/beginning of winter. Once the new calf is born, we will bottle feed with Momma’s milk to start oxen training right away. 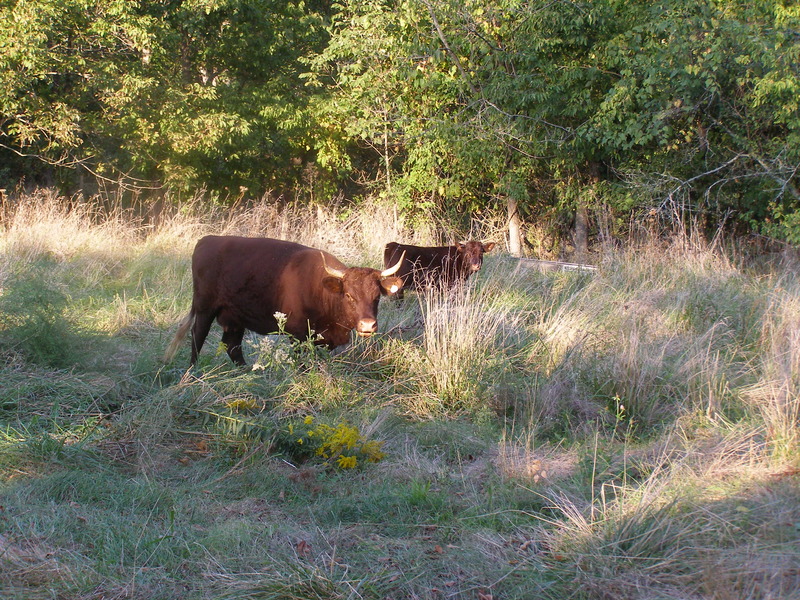 In the summer of 2015, Clem and Redd will both be ready for breeding and the herd will start to grow. Loved your story. My wife and I have a herd (12 now) of MD’s and a couple of beef Devons in central VA. We haven’t been too successful on the milking side (my fault, not the cows), but we have enjoyed raising them, selling steers for beef, and seedstock for other farmers.